We celebrated Thanksgiving Eve with a trip to Crown Candy and the City Museum. I took only a few pictures at the museum because it's easy to lose your mind the kids if you blink let alone look down to dig your camera out of your purse. You'll have to take my word for it that the kids had a great time. And that they survived the Dirty Ball Pit. After dinner it was time to get to work on Thanksgiving preparations. Vance wanted to help and we took full advantage of his eagerness. Vance and Vaughn tore toast for the stuffing. He mixed the sweet potatoes. He even crimped the edges. Next year he's on his own. We'll just get in his way. 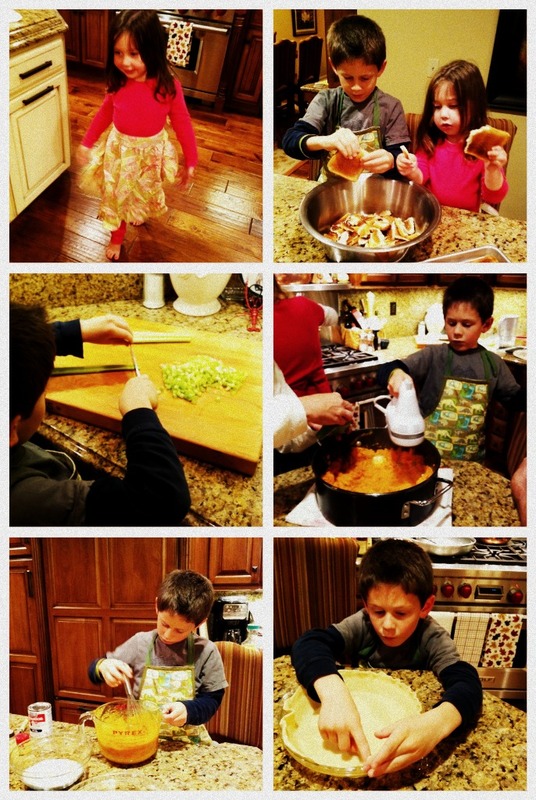 Look at those kids helping in the kitchen. He did a great job with that pie! It tasted great too! He's always loved to help in the kitchen and I enjoy his help! Cute pics!!! Looks like he does have it covered for next year.